In commemoration of the 40th anniversary of the Treaty of Peace and Friendship between Japan and China, this exhibition presents for the first time in Japan the life and art of Qi Baishi (1864–1957) – a celebrated master of modern Chinese painting – through his work in the collection of the Beijing Fine Arts Academy. Baishi is the most renowned and appreciated artist in China today, while the Beijing Fine Arts Academy, where he served as the first honorary director, is China’s oldest and largest modern fine arts academy. It is also an institution recognized for its extensive collection of Baishi’s masterpieces. It gives us great pleasure to hold this large-scale exhibition, bringing Baishi’s work from overseas to celebrate the continuation of amicable relations between Japan and China. Moreover, we hope this exhibition will serve to further promote mutual understanding between our two nations. Lastly, we wish to express our deepest gratitude to the Beijing Fine Arts Academy, and to all of the individuals and institutions who provided their kind assistance and cooperation for this exhibition. While working as a craftsman, Qi Baishi delighted his patrons by coming up with new patterns for traditional motifs like plum blossoms, orchids, bamboo, and chrysanthemums. Later, he continued to hone his technique through tireless efforts such as studying painting manuals, copying paintings from bygone eras, and sketching from nature. As a result, his flowers and trees became even more stunning with bright colors, vibrant splashes of ink, and fluid brushwork. 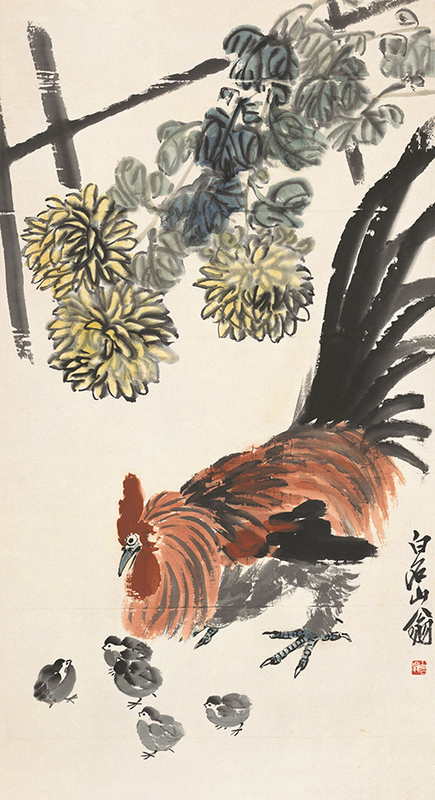 After boldly filling in flowers and trees, Qi Baishi would add life to his scenes with birds such as ducks, chickens, and hawks. A particularly striking aspect of these birds is their expressive eyes. Baishi learned the importance of depicting birds with a sense of dynamism from his mentor, Hu Qinyuan. This teaching is reflected in his birds’ human-like gazes. 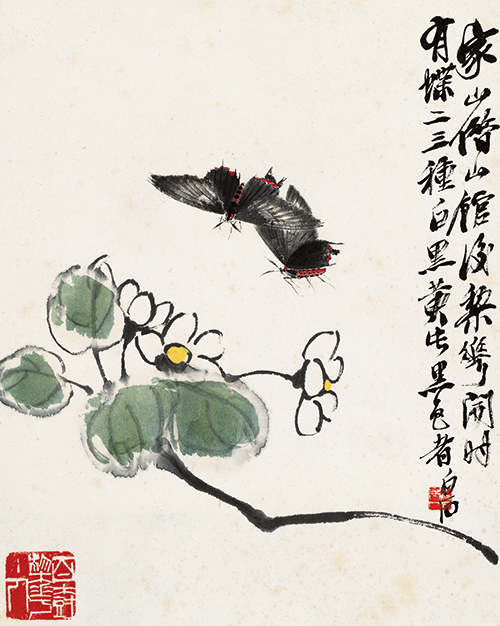 Qi Baishi is said to have enjoyed closely observing insects and capturing their forms. Although he tends to be thought of as an artist who favored simpler representations in his works, Baishi’s intricate depictions of insects astonish with their precise grasp of fine details such as antennas and the patterns of legs and wings. His use of empty space in placing tiny insects on the page also showcases his artistic sensibilities. Qi Baishi used subtle ink washes to produce many paintings depicting schools of fish, shrimp, crabs, and other aquatic life. Born in a farming village, Baishi is said to have familiarized himself with the ceaseless underwater gatherings and scatterings of these creatures as a young boy. His works expertly convey the continual movement and vitality of aquatic life. 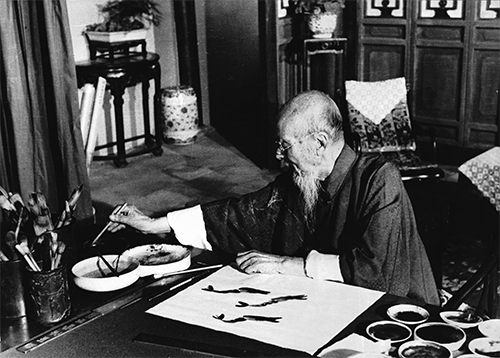 After the age of forty, Qi Baishi had more opportunities to tour the country. While comparing the traditional representations of landscapes that he had learned from manuals and old paintings with real-life scenery, he grew to establish his own original style. Baishi’s landscape paintings are notable for their distinctive compositions, simple and vigorous brushstrokes, and vibrant, gorgeous colors. Although Qi Baishi also produced realistic portraits and detailed paintings of beautiful women earlier in his career, he later grew to favor simpler forms based on robust lines. Baishi’s human depictions delight the eye with the exaggerated, almost comical figures born from his deft brushstrokes. 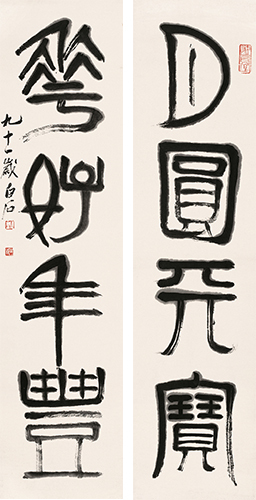 Qi Baishi developed an interest in seal carving at a young age, and also loved the calligraphy upon which it was based. After studying the carvings of the Zhe School (Xiling School) and Zhao Zhiqian, he later explored the seal scripts of the Qin dynasty to the Three Kingdoms period, establishing his own unique styles and chiseling techniques. 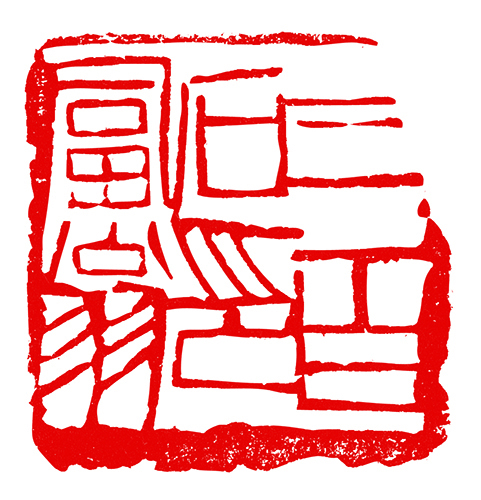 Baishi’s seal carving is characterized by rigid, well-modulated thick and thin lines, simple shapes, and a seal composition that emphasizes the contrast between the red of the ink and the white of the paper. His bold, dynamic chiseling style also reflects his experience as a carpenter and joiner. In Qi Baishi’s younger and poorer days, he is said to have borrowed picture books from acquaintances, and copied them by laying thin sheets of paper over each page and tracing the pictures with fine outlines. Later, he continued to accumulate sketches by carefully copying old paintings and drawing real-life scenery on his travels. 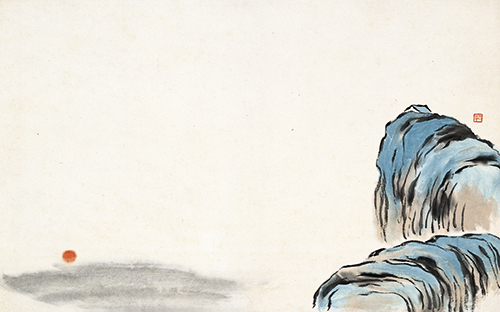 These sketches could be considered the origins of Baishi’s creative work. Although Baishi was with a non-academic family background, he began learning how to compose poems to serve as inscriptions on his paintings. Poetry eventually became one of his great pleasures. His artistry lives and breathes in the manuscripts of his poem anthologies and the journal in which he recorded his daily inspirations. Admission These works can be viewed by paying the admission fee for regular exhibils. * () indicates fees per person for groups of 20 or more. * Admission is free for senior high/junior high/elementary school students and persons under 18 and over 70 years of age (please show proof of age when entering). Persons with disabilities and one person accompanying each are admitted free of charge (please show ID when entering). 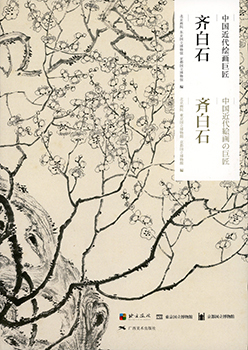 * The special exhibitions Collaborative Exhibition Project between the Tokyo National Museum and the Philadelphia Museum of Art: Marcel Duchamp and Japanese Art (Tuesday, October 2, 2018–Sunday, December 9, 2018, Heiseikan Special Exhibition Galleries) and The Buddhist Sculptures of Daiho’onji, Kyoto: Masterpieces by Kaikei and Jokei (Tuesday, October 2, 2018–Sunday, December 9, 2018, Heiseikan Special Exhibition Galleries), require separate admission fees. * Free admission to the regular exhibitions on December 23 to 25, 2018 (excluding special exhibitions). On sale in the museum shop.